Elizabeth Warren received a warm at Netroots Nation on Saturday. Las Vegas (CNN) – The woman many in the progressive community hope will be the first head of the new Consumer Financial Protection Bureau received a hero's welcome Saturday at the Netroots Nation convention. Speaking at a seminar on building a progressive economic vision, Elizabeth Warren received a standing ovation as soon as she was introduced. Warren, head of the congressional panel overseeing the government’s Troubled Asset Relief Program, is considered a strong advocate for the working and middle classes and has been one of the fiercest proponents of the new consumer bureau, a centerpiece of the financial reform bill signed into law earlier this week by President Obama. Some in the administration privately oppose Warren because of her outspokenness and work on the bailout panel. During her speech Saturday to several hundred activists, Warren laid out what she thought should be some of the priorities for the new bureau: be a strong advocate for families; base it on realistic views of the effects of regulation; and make sure the bureau can adapt to changing economic circumstances. Her remarks also indicated how enthusiastic she is about changes the new bureau might mean for consumers. Specifically she pointed out this will be the first agency to be created in a wired world, and should create conditions whereby consumers and regulators can instantly talk to each other. “The possibilities here are endless,” she said. Warren also asked the audience to help shape the agency and to push ideas they have. Reviewing how often lobbyists had predicted they would be able to kill the new agency, Warren said there is a lesson in that for the future, as lobbyists will continue to try to limit its scope. “We didn’t give up. We scratched and we built and we hung on,” she said. She never directly referenced the possibility of being the bureau’s first administrator although other speakers did. But Warren did generally reference it at the end of her speech. “One way or another I will keep fighting for the middle class,” she said. Warren later appeared on a separate panel on the forgotten foreclosure crisis at which she was lauded as the mother and godmother of the consumer bureau by panelists. “I really hope the Obama administration appoints her,” Sen. Jeff Merkley, D-Oregon, said. “My fingers are crossed. My toes are crossed.” The audience roundly applauded. Warren then said thank you to the Senator. 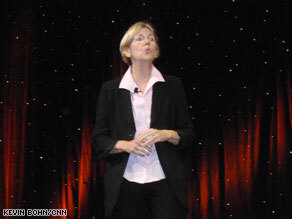 Read more about Warren's rock star status at Netroots here. Why these fluff stories CNN ? Lets hear about one of Obama's best friends, the bomber of the U.S. Capitol , William Ayers. This women is as fricking dangerous as the Imam Obama himself. Whose is the bigger political whoar, Warren or Pelosi ? After the trials we can only hope the public hangings on the Washington Mall will be televised. The only Consumer Financial Protection Bureau that should exist is each individual on their own. It's called personal responsibility and free will. Progress is NOT government control. Study some history beyond the last 9.5 years people! I say 9.5 years, because the Bush blamers recall the last 8 years, only his 8 years in office started 9 1/2 years ago. Shes a true liberal socialist ! A true star is born...thank God. The people in the WH who are worried about her should be fired..She brings a lot to the table and the movement as well as the right direction for the country. Get her on board right now. Great spin, CNN! She's "warmly embraced" by fellow lib radical socialists and the state-run MSM. NOT mentioned is that she is rounded condemned by almost everyone else as being a total disaster, much like most of Obama's radical socialist czars. We need her. So what if she's not their first pick. President Obama said he could handle a Team of Rivals. He has praised Secretary Clinton so may Ms. Warren be the next one selected. When I see this lady attacking Fannie/Freddie for the fraud that these insitutions are, then I'll sing her praises! However, there is no way a community organizer would nominate someone that would have the audacity to do that! Netroots don't let perfect be the enemy. You have to support Pres. Obama the fight is still along way off. Get Democrats elected to finsh the job this Novemeber. No stopping us now, keep on moving. another Obama disaster for the country; oh well what else is new????????? Wonderful, absolutely wonderful!!! There is added hope for our nation with the appointment of Elizabeth Warren. Knowing the nut jobs she is speaking to, she has to be a whacko and therefore perfect for the administration of an inept, incompetent, corrupt, slimy, union toady president. After the Shirley Sherrod debacle, Obama needs to prove he can stand strong quality people in his administration Elizabeth Warren would regain some sorely missing credibility. As well as put a strong consumer advocate with a wonderful warm heart. What's taking so long to just say yes to her? I don't see why it should be even a problem to appoint her. Any White House adviser who is trying to oppose her nomination is just an anti-Obama, so he/she expects President Obama to fail. Even if she is not the best candidate professionally, but politically, she is because of her 100% support by President Obama "VOTERS".